Tripp Lite P403-006 Cisco Serial Rollover Console Cable will allow you to connect your PC or Laptop to a Cisco device through the console port. This cable is identical to the one that ships with Cisco switches, firewalls, routers, wireless devices including the Aironet 1200. It works with Cisco gear both new and old. If you have a newer PC or laptop, it may not have the 9-pin serial port, in which case you would purchase Tripp Lites USB -Serial adapter, which will connect the two DB9 ends together. 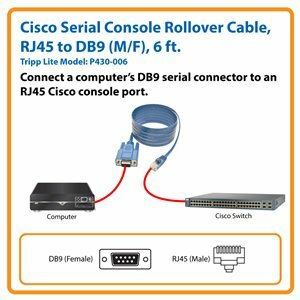 Connect your computer’s DB9 serial port to an RJ45 Cisco console port with Tripp Lite’s P430-006 Cisco Serial Console Rollover Cable. Perfect as replacement for a worn-out or missing cable, the P430-006 is equivalent to Cisco® AIR-CONCAB1200 (72-3382-01). The RJ45 connector on this cable plugs into the console port on Cisco switches, firewalls, routers and wireless devices, including the Aironet 1200. If your computer lacks a DB9 connector, use Tripp Lite’s U209-000-R USB-to-Serial Adapter Cable with the P430-006 to make your connection. The P430-006 comes with a lifetime warranty. It’s manufactured in compliance with strict RoHS specifications, reflecting Tripp Lite’s commitment to environmental responsibility.